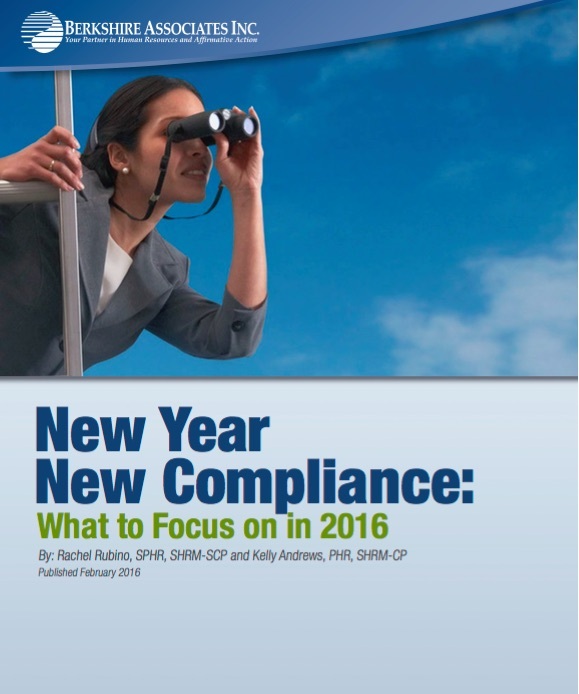 New Year, New Compliance: What to Focus on in 2016 examines the changes that will impact compliance in the year ahead, including Office of Federal Contract Compliance Programs' (OFCCP) anticipated enforcement agenda and how federal contractors can prepare. Berkshire Associates, a leading human resources consulting and technology firm, releases its latest white paper, "New Year, New Compliance: What to Focus on in 2016." This paper examines the changes that will impact compliance in the year ahead, including Office of Federal Contract Compliance Programs' (OFCCP) anticipated enforcement agenda, and how federal contractors can prepare. The year 2015 proved to be a busy one for OFCCP, and in 2016 the agency shows no signs of slowing down. Between the first full year of compliance for most federal contractors under the new Veterans and Individuals with Disabilities regulations, various proposed regulatory changes, an election year, and more in-depth audit activity, 2016 will be a year full of change for both OFCCP and contractors.